We love a great stack of pancakes for breakfast. This tasty batter makes a marvelous textured cake, but be careful not to overmix the batter or your cakes will be tough. Whisk the flour, sugar, salt, baking powder, and baking soda together in medium bowl. In another bowl whisk together buttermilk, sour cream, eggs, and melted butter. Make a well in the center of the dry ingredients and pour in wet ingredients. Stir gently just until just combined. The batter should remain lumpy, and do be careful not to overmix. Allow the batter to sit for 10 minutes. In a skillet heat 1 teaspoon oil over medium heat until shimmering. Use paper towels and wipe out the excess oil leaving only a thin film. Portion the batter into the pan in 4 places and cook until the edges are set and the bubbles on surface are just beginning to break, about 2 to 3 minutes. Flip the pancakes and continue to cook until second side is golden brown, 1 to 2 minutes longer. Serve pancakes immediately, or transfer to wire rack in preheated oven. Repeat with remaining batter, using remaining oil as necessary. 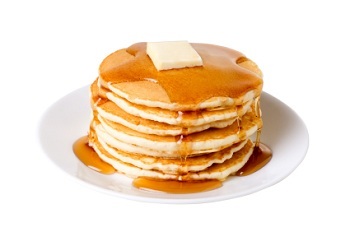 If you are not going to serve the pancakes immediately, keep them warm by adjusting the oven rack to middle position and heat oven to 200 degrees. Spray a wire rack and set it inside a baking sheet then place it in the oven. This entry was posted in Recipes and tagged buttermilk, pancakes, recipe. Bookmark the permalink.